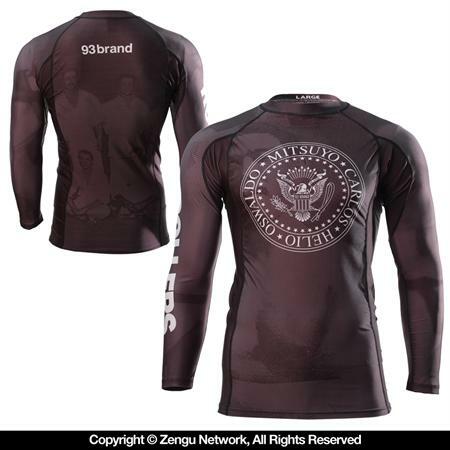 The Rollers rashguard shows 93 Brand's gratitude to the forefathers of BJJ with a clever Ramones-inspired seal. The black and white graphics are fully sublimated, guaranteed to resist fading and peeling. The crisp white of the chest seal and "ROLLERS" arm graphic offer a nice contrast against the subtly textured photo background. "Rollers" commemorates four of the grandfathers of ground-fighting, without whom we would not have the Brazilian Jiu Jitsu we know today. From the top, we've got: Count Maeda, who brought the original art to Brazil; Carlos and Helio, who fine-tuned the intricacies of the guard and Vale Tudo; and Oswaldo Fadda, who brought BJJ to the poorer areas of Brazil and encouraged the inclusion of footlocks. These four gentlemen are largely responsible for the foundation of BJJ. Their names replace those of the four Ramones, who laid groundwork themselves for the punk genre. This rashie features 93 Brand's acclaimed "7/8 sleeve" cut, an improvement over traditional long sleeve styles... 7/8 means that you'll get forearm compression/support and elbow protection, but no interference with wrist control or spider guard grips (thereby sparing your sleeve cuffs and stitching unnecessary wear & tear, extending the life of your rashguard). The sublimated interior label means there are no tags to scratch your neck. Other specs include flatlock stitching and a generous torso length. Q. I am 240 - 245 and 14% bodyfat. I feel like it would be a bad idea to get this in the 2XL as it goes all the . . .
A. I am 240 - 245 and 14% bodyfat. I feel like it would be a bad idea to get this in the 2XL as it goes all the . . . Comment. I am 240 - 245 and 14% bodyfat. I feel like it would be a bad idea to get this in the 2XL as it goes all the . . . I am 240 - 245 and 14% bodyfat. I feel like it would be a bad idea to get this in the 2XL as it goes all the way up to 280. I feel might be able to sneak into the XL. 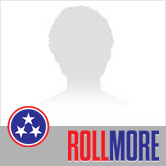 Anybody have experience with this? XL would be a little snug, but you could try it. What's your height?